From the film series that is Jurassic World, the latest summer 2018 movie release, Jurassic World: Fallen Kingdom, is about Owen Grady and Claire Dearing returning to the island of Isla Nublar to save the remaining dinosaurs from a volcano that's about to erupt. The adventure soon sees them encounter terrifying new breeds of gigantic dinosaurs, while uncovering a conspiracy that threatens the entire planet. The film is the fifth instalment of the Jurassic Park film series, as well as the second instalment of a planned Jurassic World trilogy. 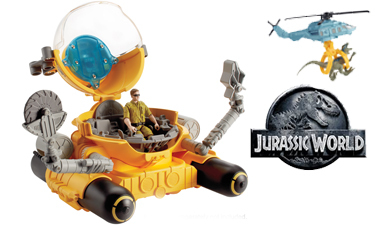 Action packed Jurassic World toys, manufactured by Matchbox under the umbrella of the biggest toy company in the world, Mattel, are now available at Baby Brands Direct. The toys include everything from the dinosaur transporters to the dive submarine that will have kids excited and busy creating adventures of their own. Jurassic World toy dinosaur figures by Mattel are also new to the wholesale portfolio at Baby Brands Direct following the 2018 movie release already grossing over $1billion at the box office. Taking over $148 billion at the box office in its opening weekend, has made Jurassic World the second most successful opening for a Universal film of all time, Jurassic World: Fallen Kingdom. The film has enjoyed the number one film slot in 67 different countries including the USA, Brazil, Australia and Mexico. With much of the filming for the Jurassic World movie shot in England at the Pinewood Studios the excitement around the movie release has been all the more heightened. Mattel, a global leader in the manufacturer of pre-school toys has the licence for the toys and produced a range of entry level dinosaur figures to high tech Gyroshere’s that are remote controlled. There are a lot of toy features and price points for retailers to choose from to create a wholesome offering of the Jurassic World toy merchandise. Registered retailers with appointed distributor Baby Brands Direct can access supply at trade price, alongside volume discounts and other account holder benefits.